Approximately one in seven Britons believe that they have seen a ghost at some time in their lives, so it’s not surprising that, among that number, are quite a few celebrities. Read our run-down of celebrity ghost encounters. The Royals spend much of their lives in ancient castles so you might expect them to have seen a ghost or two. And you wouldn’t be wrong. 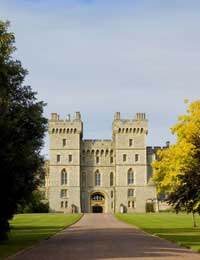 The Queen herself is said to have spotted the ghost of John Brown, Queen Victoria’s servant and friend, on the grounds of Balmoral. And, within Windsor Castle, Princess Margaret is reported to have seen the ghost of Elizabeth I. Pop stars seem to be highly attuned to the paranormal realm, judging by the number of ghostly encounters they have had. Oasis lead singer Liam Gallagher claimed the ghost of John Lennon appeared to him a few years ago. He didn’t say whether the legendary Beatle gave him a tune or two to use in his next album. The family of ageing rocker Mick Jagger spotted headless ghosts at their holiday home in France. Jagger’s daughter, Elizabeth, claims she saw the ghost of a woman holding her head in her hands, and believes the apparitions may be of the building’s former owners, who died during the French Revolution. Sting is another pop star who’s had a spooky encounter. He reportedly saw the ghosts of a woman and child while lying in bed with his wife, Trudie. At first he thought the ghosts were his own wife and child – the he realised his wife was still lying right next to him! The irrepressible Robbie Williams is said to have a love for all things spooky, and, according to his father, was able to see ghosts even as a child. More recently, the spirit of an old woman appeared to him while staying at Ringo Starr’s house in Los Angeles. Another expat Brit who encountered a ghost in L.A. is actor, Hugh Grant. Grant didn’t actually see a ghost but claimed that both he and friends heard a ghostly wailing sound in his home. He believes it may have been the spirit of Bette Davis, who used to live there. Romantic poet Lord Byron believed he had seen the ghost of the “Black Friar” at Newstead Abbey, his family home. The appearance of this spirit was said to herald some misfortune to members of the family, and it did indeed occur shortly before the poet’s ill-fated marriage to Annabella Millbanke. Even the venerable Winston Churchill had an encounter with a ghost. Reportedly, while staying in the Lincoln bedroom at the White House in the Second World War, Churchill saw the ghost of Abraham Lincoln himself. Legend has it that he asked for his room to be changed the next day. So you see, it’s not just publicity-seekers, hoping for their fifteen minutes of fame in the local newspaper, who claim to see ghosts! Famous people do too! So it must all be true then. Annabella Millbanke now haunts the Hall. Seen on the 2nd of Febuary. The date she was married. Seen running along what is known as 'Byron's Walk' next to the Estate.